LEXINGTON, Neb. - It was announced this week that Heather Heinemann has been appointed to the position of General Manager of the Lexington Clipper-Herald. Heinemann has been a sales representative at the Clipper-Herald since May 2013. Prior to that, she was the Community Relations Director at what was then called Park Avenue Estates (now Brookdale Lexington). Heinemann is a lifelong resident of the Lexington area and now lives with her husband, Dan, near Darr. She has three children (Laura Strode, Tanner Nelson, and Tasia Strickland) and two granddaughters. She is active in area organizations, and in 2015 she was named Ambassador of the Year by the Lexington Area Chamber of Commerce. Heinemann assumes her new role Monday, Oct. 10. She will be responsible for all aspects of the Clipper-Herald’s operation. Current publisher Katy Bergstrom has accepted the position of lead salesperson for Big Red Auto Book out ofGrand Island. “Katy’s roots are in advertising and the Big Red Auto opportunity is a great fit for all involved,” said Barenklau. Craig Uden, fourth-generation cattleman from Cozad, Neb., has been elected president-elect of the National Cattlemen’s Beef Association (NCBA). The election by the NCBA board of directors was conducted Jan. 30 at the organization’s annual meeting during the 2016 Cattle Industry Convention and NCBA Trade Show in San Diego, Calif.
Uden is a partner in Darr Feedlot, Inc., a commercial cattle feeding operation, and with his wife, Terri, also owns and manages three commercial cow-calf operations. He has been involved with NCBA since the mid-1980s, serving in leadership positions on numerous committees and as Policy Division vice chair in 2014. He was the Federation Division chair in 2012, and last year served as NCBA vice president. Uden has also been active in his state cattle organizations, serving as president of the Nebraska Beef Council. He has served on the Nebraska Cattlemen Board of Directors as a committee chair and vice chair, the Nebraska Cattlemen Research & Education Foundation, and is involved in the Nebraska Feedlot Council. A graduate of the University of Nebraska, Uden is active in numerous other local and state organizations. He is past chairman and elder of TrinityLutheranChurch in Lexington, on the board of the Dawson County Ag Society, is a member and past chair of the Dawson County Cattlemen’s Association, and is a 4-H leader. Initiated in 1898, the NCBA is the oldest and largest association of U.S. beef producers, and is the marketing organization and trade association for America’s cattle farmers and ranchers. With offices in Denver and Washington, D.C., NCBA is a consumer-focused, producer-directed organization representing the largest segment of the nation’s food and fiber industry. A memorial fund has been established for the beautiful family of Denise Carlberg at the Pinnacle Bank in Elwood. JOHNSON LAKE, Neb. – At approximately 11:40 a.m. the Gosper County and Dawson County sheriff’s offices were notified of a traffic accident at the inlet bridge of Johnson Lake on Johnson Lake Drive in Gosper County. After an initial investigation, a vehicle driven by 54-year-old Denise Carlberg of Johnson Lake was driving north on Johnson Lake Drive when the vehicle left the roadway and went down an embankment, according to a press release issued by Gosper County Sheriff Dennis Ocken. The vehicle then entered the Tri-County Canal. Carlberg and the vehicle were recovered at 5:30 p.m., where she was confirmed to be dead. An autopsy has been order. The Gosper County Sheriff’s Office was aided with the accident and recovery by the Dawson County Sheriff’s Office, Johnson Lake EMS, the Lexington Volunteer Fire Department dive team, Kearney Volunteer Fire Department dive team and Central Public Power District. Rescue workers from several area agencies including Lexington, Johnson Lake and Kearney prepare a dive team to find a car that had fallen into the Tri-County Canal at the south inlet of Johnson Lake. The car and its driver, 54-year-old Denise Carlberg, were pulled from the canal at 5:30 p.m. Monday. Carlberg was pronounced dead at the scene C-H photo • Dean Erickson. light display at the Chapel of the Lake — at Johnson Lake, NE. The Central Nebraska Public Power and Irrigation District’s board of directors voted at Monday’s monthly meeting to appoint Ron Fowler of Johnson Lake to fill a vacancy on the board. Fowler was selected by a vote of the directors from a field of three applicants to serve the remainder of Richard Hove’s term which expires in 2015. Hove, also of Johnson Lake, has represented Gosper County on the board since 2010. He resigned because he is moving to Lincoln. Fowler is a graduate of the University of Nebraska-Kearney with B.S. degree in chemistry and biology. He retired in 2009 from the Eaton Corporation in Kearney after more than 30 years with the company, most of which were spent in management positions. He has been associated with Johnson Lake through a cabin/residence that has been in the family since 1971. He has been a representative on the Johnson Lake Development, Inc., board (the cabin-owners’ association) since 2010 and has served the last two years as JLDI’s liaison to Central’s board. Fowler will be formally seated at the Nov. 22 committee meeting of the board. Board President Dudley Nelson thanked Hove and presented him with a plaque in recognition of his service to the District. • The board approved agreements with Investment Property Exchange, Inc., (IPEX) of Kearney to provide appraisal services associated with property to be acquired for construction of the J-2 Regulating Reservoirs. In addition, the board approved an agreement with Luhrs Real Estate and Appraisals of Imperial to complete a review of the appraisals. A review appraisal is necessary in this instance to comply with federal regulations for appraisals involving projects in which federal funds will be expended. • The directors approved a contract change order for $113,680 payable to Allen Blasting and Coating, Inc., to cover charges incurred as a result of delays after the company mobilized for a siphon-coating project on the E65 Canal. The project was delayed after floodwaters from the South Platte River were diverted into Central’s system to ease flood damage and to provide groundwater recharge benefits in the area. • John Thorburn, Tri-Basin Natural Resources District manager, thanked Central’s board and staff for their cooperative efforts during the South Platte River flooding. He said that cooperation between Central and Tri-Basin to divert floodwaters will provide recharge benefits in the Platte River and Republican River watersheds, as well as recreational benefits at Elwood Reservoir. • Civil engineer Cory Steinke reported that inflows to Lake McConaughy were about 1,010 cubic feet per second on Monday morning, which is about 65 percent of normal for this time of year. The reservoir was at elevation 3229.6 feet above mean sea level with a volume of 868,000 acre-feet (49.8 percent of capacity). The reservoir has risen about five and a half feet in elevation since the end of irrigation season. JOHNSON LAKE – What started out as a fundraising project for the Johnson Lake Art and Wine Festival, has turned into an iconic rendering of the thriving recreational area. 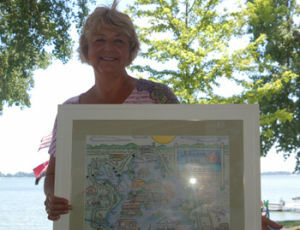 The colorful, detailed drawing of Johnson Lake by Bonnie Marshall, was originally undertaken as a fundraiser and promotion project for the Johnson Lake Art and Wine Festival, where the original drawing sold at auction for $800, Marshall said. As part of that fundraising effort, Morris Press from Kearney printed 1,000 copies of the drawing, which shows a comprehensive portrait of businesses and attractions around Johnson Lake, with the proceeds benefiting the Johnson Lake area, Marshall said. “All the profit from the posters goes to the Johnson Lake Chamber of Commerce, which will distribute the proceeds to the Hike and Bike Trail, the Chapel, the Lake EMS and to general Lake improvement projects,” Marshall said. Marshall, a former nurse, said although she later went back to college to study commercial art, she prefers to channel her artistic side for important projects. She said drawing the Johnson Lake map was a months-long project, which she worked on using colored pencils. “I drove around the Lake, taking pictures of each of the business at the Lake,” Marshall said about wanting to include every business at the Lake and making her drawing look more accurate. JOHNSON LAKE — Stan Vodehnal isn’t sure why he likes planting trees, but he knows he likes it. Maybe it started with gardening and the thrill of watching something small grow bigger and reveal its usefulness. “You can take pride when you know you put in a 6-foot tree and in 10 years it’s 20 feet tall,” he said. He planted his first tree as an adult in the yard of the first house in Omaha where he and his wife, Stephanie, lived. They still go by from time to time to see how that tree is doing. For Arbor Day one year, a bank in Cozad offered its customers a pine pencil tree to plant. It was no more than a slender tree in a bag with its roots wet and no dirt, Vodehnal said. He asked if he could have more than one and planted them. That was 10 years ago. Vodehnal’s tree planting passion has evolved to benefit the Johnson Lake Hike and Bike Trail. The lake has been his home for 18 years, and he’s a trail committee member. Even before the trail was laid, Vodehnal planned for and planted trees. He continues to add them, envisioning how they will benefit trail users in the future. “It may not look like much now, but in five years people will be able to come and enjoy the shade,” Vodehnal said. In one section there are four honey locusts planted on each side of the concrete path. “It’s going to be cool, I think,” said Vodehnal of the tunnel-like canopy they will form someday. Another spot has two cherry trees, which were selected because they won’t grow too tall and interfere with the overhead power lines. The fruit will also attract the neighbors, as does the community garden nearby. donated trees it doesn’t want to winter from its end-of-the-year stock. “It’s a mix and match,” Vodehnal said of the varieties. He also has planted fiesta maples, aspens, oaks, golden raindrop crabapples, flowering crabapples, river birches and elms. Vodehnal hasn’t tracked how many trees he has planted. He said someone told him there were more than 60 trees in the North Point section of the lake, but he doesn’t count them. 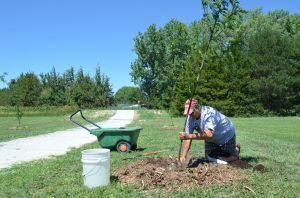 Sometimes, Vodehnal invites neighbors to help plant trees. He emphasized he isn’t the only one working to beautify the area through trees. Neighbors water the trees along the trail near where they live and mow the surrounding areas. Two or three years ago, Vodehnal planted two matching memorial trees, royal red maples, near where fireworks are discharged each year. One was for his father, Irvin “Vodie” Vodehnal, and one was for his brother Bruce Vodehnal. Months later, he received a phone call informing him that a buck deer had rubbed the bark off and killed the tree planted in memory of his brother. He replaced it with a summer splendor maple donated by Liens Lawn Service. The tree was questionable because there was an entire side with dead limbs, but Vodehnal said he thought it seemed perfect because his brother struggled with a personal issue his entire life. He recently noticed the tree is leafing out on the bad side — a sign that it’s going to make it. used flashlights to see. It was a touching, impromptu moment, he said.